The so-called “golden age” of boxing might have been and gone, BUT there’s no doubt we’re in the midst of a pugilistic revival. Through a combination of colourful characters, rising stars and formidable champions, boxing is now on a high. While it’s possible to argue that viewing figures and general interest have dipped following the advent of mixed martial arts (MMA) and the UFC, the game is currently thriving. With the buzz back and some slick fighters looking to assert their dominance, there are plenty of potential match-ups we can start salivating over. Of course, politics, money, and in some cases, logistics may mean we’ll never get to see some of these showdowns take place. However, in the spirit of entertainment, it’s nice to speculate, which is why we’ve outlined some boxing matches we’d really love to see. If there’s one fight that boxing fans are talking about more than this one, then we’re yet to hear about it. For most people’s money, Golovkin is the best pound-for-pound fighter in the world, and looking at his record, it’s hard to argue. When you include amateur fights, Golovkin has taken on more than 200 opponents, and as a professional, he has a perfect 36-0 record. Among his best assets is his legendary punching power, which if the rumours are true, has been known to putdown light heavyweights in the gym. However, if there’s one other boxer in the world who can match that impressive power with a ferocious fighting style, it’s Alvarez. 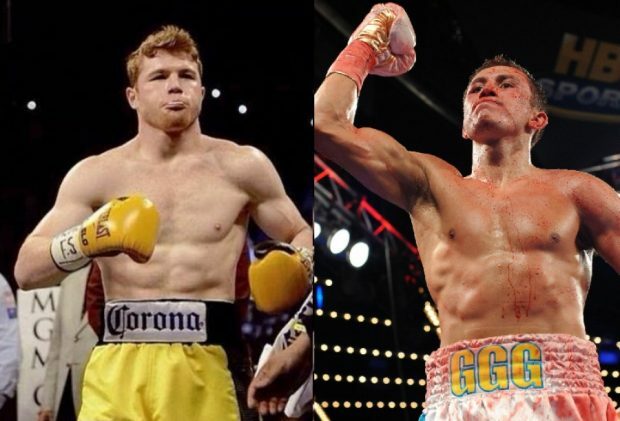 Despite a couple of blemishes on his record (48-1-1), Canelo is a Mexican fighter in every sense of the word. If this fight doesn’t happen, then it will be down to politics and nothing more. With many feeling Alvarez is being protected by his management team Golden Boy, the showdown we’re all waiting for may remain a dream. However, if it ever does go down we can certainly look forward to some fireworks. When it comes to British grudge matches, this one has all the makings of a classic. Much like his father did with Nigel Benn, Eubank Jr has an uncanny knack of getting under Saunders’ skin. Before their first showdown, a series of press conferences revealed the bad blood between the two, with Saunders slating everything about Eubank including his fighting style, his fees and his “deluded” idea that he could beat Golovkin. For those that don’t know, Saunders went on to win the first fight on points, but Eubanks Junior and Senior were not happy. As is often the case in close fights, the losing camp have been quick to contest the decision at every opportunity; however, so far, the two fighters have engaged in nothing more than a war of words. When it comes to skills in the ring, Eubank Jr is undoubtedly a world-class fighter. In 24 fights he’s only lost once and that was to Saunders, which if he’s any mark of a man, he’ll want to avenge with every fibre of his being. For Saunders, a perfect 23-0 record means he’s gunning for the likes of Golovkin, but a big money fight against his old foe would certainly get his attention. Unfortunately, as has been publicised in the media, Eubank Jr appears to have a problem with his pen. After failing to sign a contract to fight Golovkin, he then pulled out of a British title fight with Liam Smith (and relinquished his belt in the process). At this stage, we’re not sure when or where Eubank Jr will fight, but we hope it will be against Saunders. It’s a fight that could prove a logistical nightmare to arrange, but if it did ever go down then it would be one for the ages. Despite being a retired fighter, Floyd Mayweather is still the biggest draw in boxing, and if he were to ever lace up his gloves again, there’s little doubt he’d set box offices alight. Undefeated in a career that spans 19 years, one of the highest paid athletes of all-time and attracting pay-per-view sales totalling $1.3 billion, Mayweather is unquestionably one of the greatest boxers ever. However, in recent months he’s been toying with the idea of a crossover fight against a similar-sized and equally popular MMA fighter by the name of Conor McGregor. The talented Irishman was an amateur boxer as a teenager before he turned to MMA. Today, with a 20-3 record, he’s regarded as the biggest draw in MMA and someone with a supreme skill set. Whether it’s punching, kicking or grappling, McGregor is, in his words, “a master of movement”, and he firmly believes he could beat Mayweather in any form of combat he chooses. If the two were to meet in the boxing ring, Mayweather would certainly have the advantage. His footwork and timing would help him avoid McGregor’s powerful left straight, but could he adjust to the MMA fighter’s awkward movement pattern? As for McGregor, throughout his MMA career he’s proved his chin is made of granite, and considering Mayweather has only scored 10 knockouts in 26 fights, it’s unlikely he’d floor the UFC star. However, it’s also worth noting that McGregor won’t have faced a puncher with the speed or accuracy of Mayweather. They say that speed kills, and that could be the defining factor if this fight ever went down. When it comes to boxing, there are plenty of match-ups we can dream about. However, if you’re looking to deal with the here and now, thankfully there are more than enough confirmed fights that offer the perfect boxing betting opportunities for fans, punters and pundits alike over at Sun Bets.